Simplex LJ 4000 rear derailleur. Design is identical to the SLJ model, but upper and lower pivots are made with Delrin (Simplex's miracle plastic...), instead of aluminum.. 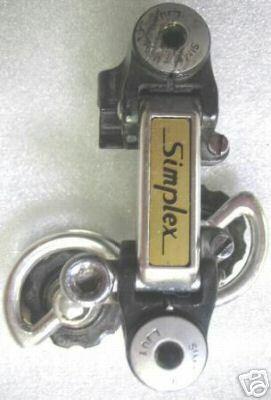 Although the inner plate has a "Simplex Super LJ" marking (probably because this specific part was produced in first place for the SLJ derailleur), the model does not belong to the SLJ series. This to be a photo of the CP/SP model (short cage?) while the T/SP model appears to be a longer cage version with a max cog and wrap of 30T each and there was also a Long Cage version which was known as the 4000 GT. Very close inspection of the jockey cage is needed to distinguish the CP from T models.